The year was 1976. The nightclub in Aspen where I worked had booked a two week gig with comedians from The Comedy Store. Steve Martin had been our guest a few weeks prior and I thought whoever was sent from L.A. could not come within a hundred miles of his rising star. Since I would be hearing the show night after night, I thought I would be in for a big snooze. On the night I met Robin Williams, I arrived at the club early and checked in with my friend who worked in the office. He said the guys were setting up backstage. Remembering I had left my black, high-heeled boots there earlier in the day, I thought I could sneak in unobserved and retrieve them. I pushed the curtain aside and reached down to pick them up, almost bumping in to a handsome young man wearing a long sleeved tee shirt, suspenders and khakis. “I’m sorry to disturb you. I just came to get my boots.” I put out my hand and introduced myself. “I’m Robin,” he replied. “I was going to use those in my act.” He took one boot from my hand and put it on like and evening glove. As soon as he started making jokes, I thought the week might be looking up after all. Being that I was the lowly coatroom girl, I was free to watch the show. I stood in the back when he took the stage introducing himself as “Russia’s only comedian.” After the show, we all gathered for our one free drink, sponsored by the owner, and then went out on the town after that. Word spread like wildfire and the crowds grew larger every night. Robin came back in the summer to open for a band that ended up canceling at the last minute. It was like a classic movie scene where we learned the business would fold if we couldn’t come up with some wild scheme to fill the place. The idea of asking Robin to do the whole show was absolutely preposterous, but knowing we would all be out of work if he failed to save the day, we persuaded him to say yes. He didn’t know if he would be able to do it, to go from fifteen minutes of comedy to performing a one man show. He wasn’t sure if he had enough material from what seemed to stem from a stream of consciousness. We offered all the help and encouragement we could. He asked me to come onstage with him, doing a few bits when he lost his train of thought, or came to a dead end. While I watched for those times when he might need a new direction, I realized that he had a far greater wealth of material than we knew. He had characters and voices, he had skits, and bits, like one of his favorites, “Attack of the killer chairs.” Observing him made me stand back in wonder. He killed it, night after night. He had the quickest wit I had ever encountered in my life. His gift was staggering, yet he bore it with humility. Some nights he would stay “on” for an hour or two after the show, but once done it would all close, just as if someone drew a curtain across his eyes. Then he would be quiet. We all knew that someone would discover him soon and it was only a matter of time before he would go on to far greater heights. The privilege of watching his career unfold, seeing him live up to his full potential, thrilled me over and over. I knew his offstage persona, his sweet, shy manner, his dazzling intellect, his moral compass, his gentlemanly sensibility and his heart. I can honestly say that I truly admired the man, and had a fondness for him that never wavered. Under what lucky star was I born that I would bump into someone like him? We saw him when he came through Spokane in the spring of 2013, to do a retrospective show with David Steinberg. In the car on the way home, I expressed a thousand concerns and worries about Robin. That night while cheerful, generous and friendly, I sensed an overall exhaustion setting in that troubled me. The news of his death and the manner of his demise shocked us all. He will be deeply and profoundly missed. Sometimes we forget that we are mortal. Perhaps genius at that level, comes along once in a hundred years. He inspired me, every step of the way. I have never stopped believing in the power of the imagination. He reminded me of a young colt that prances and dances as he is let out of the stall. 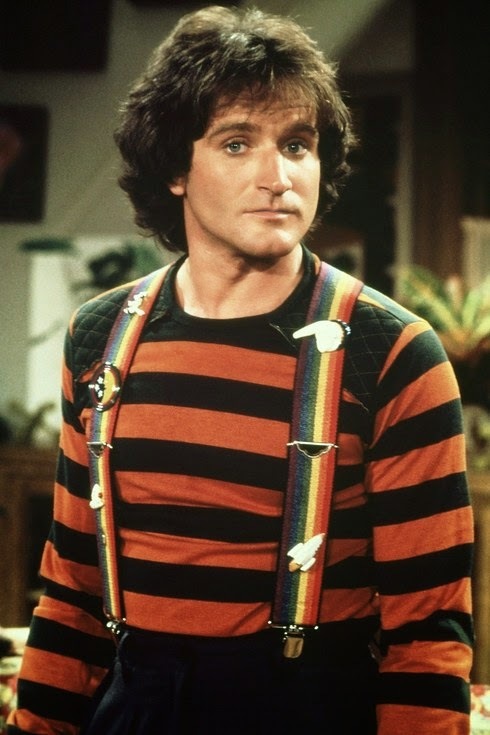 A thoroughbred with the bloodlines of a true champion, Robin took comedy in a new direction. He knew we had more in common than we realized. His peers spoke of his generosity. He touched an entire generation of children. This entry was posted in Uncategorized on August 14, 2014 by Elizabeth Smythe Brinton. Anthony Doerr was interested in the magic of radio. The idea of millions of messages being transmitted all over the world captivated him. He wanted to write a story that would shed light on the miracle of wireless communication. 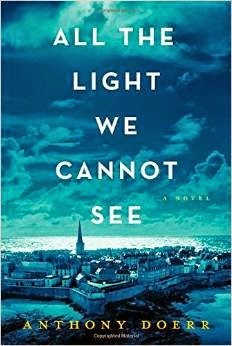 The result is All the Light we Cannot See, one of the most stunning books I have read in a lifetime of reading. The Best Food Ever Book Club, read The Memory Wall, a few years back. When the suggestion arose to read Doerr’s latest book, the answer came as a resounding, “Yes.” He is an author for whom we have developed an abiding affection. We were not disappointed by this latest choice. This story found an immediate home in our hearts. If you want to create a protagonist readers will root for, give them a few vulnerabilities. Blind from the age of five, a little girl lives with her father in Paris, learning to find her way around. War breaks out and they must flee the city. The story is woven between the perils of Marie-Laure’s situation which is fraught with anxiety and that of a German orphan, who has been swallowed up by the Hitler Youth. It is not the story alone that makes the tale so compelling. It is the power of Doerr’s prose which has the ability to make a reader stop and think before turning the page. Marie-Laure ends up hiding in her uncle’s house. War ravages the coastal town in Britanny and France is occupied. “The distress is so acute, it is almost unbearable. She tries to settle her mind, tries to focus on an image of a candle flame burning at the center of her rib cage, a snail drawn up into the coils of its shell, but her heart bangs in her chest and pulses of fear cycle up her spine, and she is suddenly uncertain whether a sighted person in the foyer can look up the curves of the stairwell and see all the way to the third floor. She remembers her great-uncle said they would need to watch out for the looters, and the air stirs with phantom blurs and rustles, and Marie-Laure imagines charging past the bathroom into the cobwebbed sewing room here on the third floor and hurling herself out the window. Werner, the German orphan, does not have an easier time of it either. This book was ten years in the making. The result is stunning, beautiful prose. This is exactly the kind of book that fills me with enormous awe and respect. It is my idea of a perfect summer read. It is a great subject in the hands of a master. I was dazzled by it. This entry was posted in Uncategorized on August 6, 2014 by Elizabeth Smythe Brinton.